Click here for the new Express Bus E-Newsletter. The original seven mile stretch of 95 Express in Miami-Dade has been extended north into Broward County. Now, 95 Express extends from the junction of I-95 and SR836 near downtown Miami to Broward Boulevard near Fort Lauderdale, a total of 21 miles. As with the original stretch of 95 Express, dynamic (congestion based) tolls are being used to help manage the congestion in Phase 2. The tolls, collected electronically with SunPass transponders, fluctuate based upon the amount of traffic in the express lanes. 95 Express Phase 1 and Phase 2 now provide you with even more options when it comes to your commute. The following information has been gathered to help you plan your trip and use 95 Express. Remember, the choice is yours! 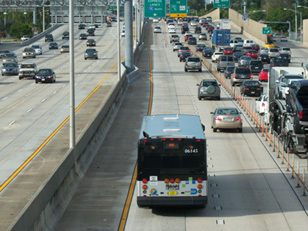 The 95 Express lanes are only for 2-axle vehicles and buses that have a properly mounted SunPass. Trucks with three or more axles are not allowed on 95 Express unless they are designated as emergency vehicles. Roadside equipment monitors traffic in the express lanes and toll prices periodically adjust to maintain free-flowing travel. As traffic in the express lanes increases, the toll price goes up to manage demand. As traffic in the express lanes decreases, toll prices decrease. Drivers will see destination and toll amount signs in advance of express lane entry points that let them know the current toll amount to travel to the destinations displayed. When the driver passes under a toll amount sign, the toll rate is locked in for the destinations shown. If the rates goes up, the customer pays no more than what was shown on the sign. If the rates go down, the customer will be charged the lower rate. The customer will see separate line item entries for each toll gantry passed on their statement. Violators will be charged the toll plus $25 per 24 hour period in which they violated. Certain vehicles may be exempt from paying tolls, please visit 1800234ride.com. 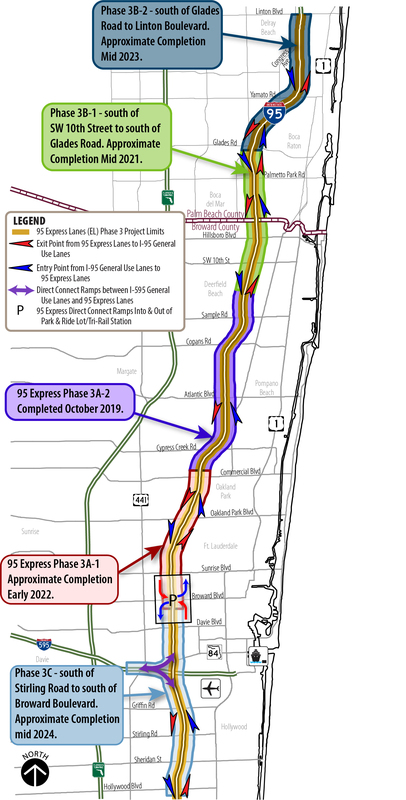 95 Express Phase 2 extends the existing express lanes north from the Golden Glades Interchange, in Miami-Dade County, to just south of Broward Boulevard, in Broward County. Total length of Phase 1 and 2: 21 miles. Three toll points in each direction. Minimum toll: $0.50 per toll point. For more information about 95 Express Phase 3 Project Development, Click Here. Tolling on 95 Express Phase 2, between the Golden Glades Interchange, in Miami-Dade County, to Broward Boulevard, in Broward County, began in October 2016. Toll paying drivers who use the express lanes must have an active SunPass account with the transponder affixed to the windshield. 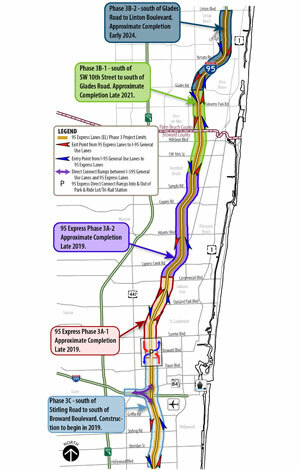 Extension of the express lanes from Southern Broward County to SW 10 Street is under construction. Registration for non-toll paying users is administered by South Florida Commuter Services (SFCS), the regional commuter assistance program funded by the Florida Department of Transportation (FDOT). Contact SFCS at 1-800-234-RIDE or visit www.180234ride.com.